I’ve come to a slight block in my writing and I’ve found only one thing helps a block. Writing or drawing about anything I want. In this Pleasure post I will talk about something close to my heart, Bunnyman. Like the Sampiro I enjoy the thought of this entity for the absurdity of it. The only difference between the two is that Bunnyman represents a more menacing presence since they tend to carry an ax with them. The name comes from the reported sighting claiming the figure to be a man in a bunny suit. Accounts on his suit state it being mostly white with another stating it being white, grey, and black. His debut in Virginia occurred in October of ’69 and he’s been playing the role of boogeyman ever since. After that incident there were many more reported during the fall season (guess he couldn’t wait for Halloween). Some reports have him terrifying children while brandishing his ax to them. There are many other rumors swirling about this twisted Trix rabbit involving but not limited to: vandalism, attacks on cars and the people there in, and murder. While the former accounts have evidence to back them up, the murder(s?) attributed to Bunnyman are probably unfounded. Along with the many rumors of his existence are the rumors of his beginnings as the Bunnyman. While his real origin deals with him assaulting people’s cars and homes there is another idea proposed. 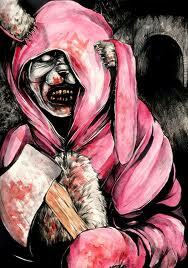 This includes the Bunnyman having been an institutionalized patient before escaping to the wilderness. Another idea to the start of his name spawned from this, where he purportedly left several discarded rabbit bodies strewn about a bridge. The bridge in question is supposedly the Colchester overpass and was soon deemed the Bunnyman’s favorite haunt. There is a downside to those rumors though. For one, in the county his was reported in the most there had never been an asylum of any sort. Secondly some people dispute about the overpass being the bridge and that the “real” one is now long forgotten in some brush deep in the woods. Whatever the case may be about him, he is now apart of the many urban legends that people tell at night to spook their friends. So much so that a movie was made in his honor last year. It’s not canon to the actual bunny mythos but then again what movie ever stays in line with urban legends. This entry was posted in Cryptozooligy and tagged bunnyman, explained, legend, paranormal, rumor, urban.